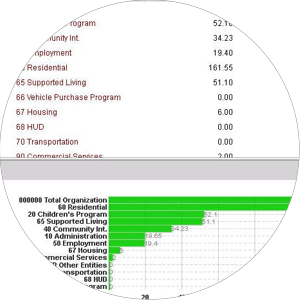 Questica’s budgeting and business performance management and transparency software solutions can help your non-profit organization achieve its mission. Bring brilliance to this year’s budget. Ditch your disorganized and time-consuming spreadsheets. Our advanced operating, salary and capital multi-user non-profit budgeting management software - PowerPlan - allows you to calculate overhead allocations, capture supporting notes and itemized details, budget by employee or position, and run unlimited what-if scenarios. Plus, we seamlessly integrate with your financial, human resources and payroll systems. Better budgeting that’s easy, accurate, collaborative and configurable. Quickly see your budget roll-up with historical context and year-to-date actuals. Allocate staff by either percentage or hours. Create revenue and expense budgets based on the parameters that drive your programs. Questica’s non-profit advanced budget management software – PowerPlan – is a comprehensive, streamlined solution that will significantly shorten your budget cycles while providing better accuracy and improved insight to the details and assumptions that drive your budget. With our solution, data is consolidated automatically, based on predefined rollup structures. Review consolidated results organization-wide by funds, divisions, departments, locations, projects, grants or any relevant element. Create revenue and expense budgets based on the parameters that drive your programs. We provide an unlimited number of user defined “driver” accounts to fit the needs of budget or program managers. Driver accounts provide for input based on pertinent assumptions such as clients served, billable days, rate per day, memberships, and indirect cost rates. We provide simple, wizard driven templates, enabling overhead allocations to be set up in just minutes without the need to work with complex formulas found in other solutions. Allocate administrative costs across departments or programs based on financial elements such as revenues, expenses, or based on driver accounts such as FTE, square footage, or any other user-defined account as your basis. Payroll based accounts such as FTE are integrated with staff budgeting in our system. As you change your staff allocations, the basis for your overhead allocations will also be updated. We provide an unlimited number of budget scenarios to facilitate performing various ‘what-if’ conditions and analyzing the results of each. Each scenario provides optional settings to support a budget or forecast template while security settings allow further options to hide scenarios by user group. 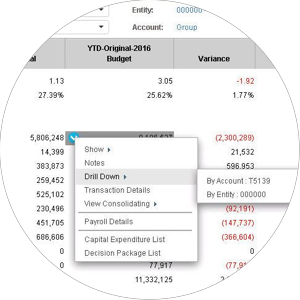 Copy all contents from prior actual data or a previous budget version, use projection tools to define global assumptions, and make budget entries and changes from a bottom up or a top-down approach. Scenarios are tightly controlled in the budgeting and forecasting process through workflow tracking of budget submissions and approvals. Our audit trail functionality has been designed to log all the changes to the configuration of the Questica environment and track all data related changes. Our system also includes inherent flexible workflow functionality which serves as a collaborative tool and allows everyone involved in the budgeting process to understand and work with the applicable budget stages and transitions. We offer everything you need for personnel budgeting within our software: added efficiency, control the process, and greater support for personnel budgeting. Utilize Questica’s predefined payroll calculations or add additional calculations modeled to your organization’s unique requirements. An unlimited number of user-defined calculations can be added to the system covering all your compensation, tax, and benefit planning needs. Split employee costs across funds, departments, grants, or funding sources based on percentage allocations or hours. Unlike other systems, our built-in logic ensures that records are 100% allocated. Grant budgeting provides an option to allocate over 100% at the proposal stage, then to true up the records before finalizing the budget. Employee level reports offer an easy review of employee allocations. Questica provides flexibility to apply personnel planning across unlimited budget or forecast scenarios. Build the personnel budget in a defined scenario, copy all contents to a second scenario, and apply rate and staffing changes for a side by side comparison. Adjust rates from a central table for a simple and efficient means of establishing detailed and accurate payroll projections. 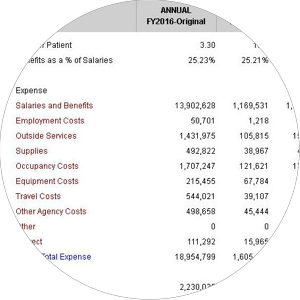 View details supporting personnel budgets with our personnel level reporting. Utilize multiple views to validate employee details. Variance reporting at the employee level provides a valuable tool for reviewing employee level variances prior to submitting reports to funding sources. Budget manager can submit requests in the budgeting process for all their capital needs. The capital expenditure request functionality provides an easy-to-use interface identifying all supporting details for each capital item. Approved requests are finalized into the approved budget and depreciation schedules flow through to the income statement and cash flow reports. This comprehensive tool is used to plan for Capital Improvement Projects and other specific budget packages such as Grants, Personnel Additions/Reductions, and Operational Expenses requiring management approvals. For details about our comprehensive reporting and analysis features, check out the Performance section. Central to an efficient and accurate budget process is maintaining a structured environment and effectively tracking status as budgets are completed. Role-based security provides an intuitive framework for defining user access to data throughout the system. Security ensures that data is controlled, from the input templates, to personnel and capital budgets, all the way through to reports and analysis. Workflow stages provide a central point from which to track budget submissions and status across the organization. At a glance, determine budgets that have been submitted and approved, budgets that remain outstanding, and distribute correspondence to budget managers with key information and timelines. Drill down further to approval history and notes tied to each budget. We take incredible pride in delivering an exceptional customer experience for every customer. Our goal is to get you and your organization up and running with little to no disruptions. Throughout the process, we listen, adapt and always uncover ways our tools and technologies can improve our customers outcomes and enhance our future offerings. Sage Intacct, and many more. Questica provides full installation documentation with every release, as well as implementation assistance, technical support and online help. Plus, we have complete training for administrators and general users through PowerPlan Help, our online learning channel. 20 fun facts to celebrate 20 years! Connect with one of our Non-profit Budgeting experts. Our team is full of motivated technology experts, business specialists and budget professionals to help your non-profit organization thrive financially. We’d be happy show you how PowerPlan, Questica’s non-profit budgeting solution can work for your organization. Set up a personalized demo, or sign-up for one of our free information sessions. The next one’s on May 9, 2019. “Because of our size, budgets were done at the six programmatic service areas and then I had to manually aggregate them. This was a very time consuming process. Now, they are combined at the push of a button."